Mary Margaret Frazier entered Heaven’s gates on Monday, September 3, 2018 at the age of 84. The daughter of Henry and Minnie (Hansmeyer) Mappes, Mary was born on April 20, 1934 in Norman, Oklahoma, where she remained, graduating from Norman High School 1952. She married Homer Ervin Frazier on June 28, 1968. She spent her early life as a homemaker, taking care of her six children. Mary loved gardening and entertaining, but nothing was more important to her than when she spent time with her family and serving the Lord at Good Shepherd Lutheran Church. She will be forever missed, but never forgotten. Five sisters; Eleanor Hansmeyer, Elsie Metzler, Pauline Hartman, Arlene Smith, & Dorothy Bauer. 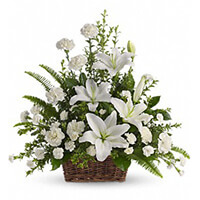 To send flowers to the family of Mary Margaret Frazier, please visit our Heartfelt Sympathies Store. 700 N. Air Depot Blvd.